Kinship and foster carers play a very important role in helping Canberra children grow up safe, strong and connected. With such an important role, comes a lot of information. 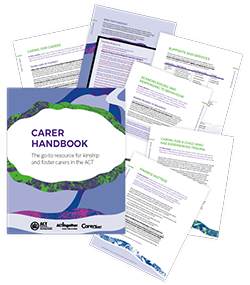 Child and Youth Protection Services (CYPS), in partnership with ACT Together and input from carer advocacy groups like Carers ACT, have developed the Carer Handbook as the go-to resource for kinship and foster carers in the ACT. The handbook provides valuable information to help carers be informed about their role and responsibilities, and where they can go for help and support. The Carer Handbook is very comprehensive and designed to be a one-stop reference guide to answer carer questions when they come up. You can access the various sections by selecting the relevant topic below, or from any page within the handbook by using the navigation links on the left of the screen. You can also down a PDF version. On behalf of our community, thank you to all our dedicated kinship and foster carers for taking on this role. We hope you find the Carer Handbook a valuable resource.